Keeping the little ones occupied will make your day go more smoothly. Deciding whether or not to have children at your wedding can be a tricky decision for any couple, particularly for those who have lots of children in their extended families. If you do make the choice to welcome kids to your celebration, you will probably want to keep them quiet and occupied throughout the day – at least until the party begins and they can let loose on the dance floor! Often times, when children are misbehaving at an event such as a wedding, it’s due to being tired, hungry, or bored. Thus, accommodating the invited children at your nuptials is both beneficial to you and the kids themselves. Not to mention, their parents will likely be appreciative of the time you and your beloved took to make sure their little ones are happy and having a good time. - If there are more than 10 children attending your wedding, you may want to hire babysitters to keep an eye on everyone. This also helps the parents relax and gives them the opportunity to celebrate with you! - Some venues offer a special quiet room during the ceremony where books or cartoons can distract the kids. - Keep in mind that the ceremony and the toasts are the times when attention spans will be the shortest, so that’s when something to occupy the little ones’ time is key. They will generally enjoy the dancing portion of the evening, so you don’t have to plan out something for the entire day. - Provide snacks and soft drinks for children during the cocktail hour. Kids have fast metabolisms and can't go long without eating, and most cocktail hour hors d'oeuvres are too complex for them. Sparkling apple cider tends to be a hit, and makes them feel grown up. - Similarly, a children’s menu during the reception is a must, otherwise food and money will be wasted. If you have a buffet, you may be okay having some child-friendly foods that the parents can help them select. - Activity books are useful at the dinner table; kids are accustomed to coloring at restaurants. Tablets and smart phones can also keep them occupied, in desperate times. - If everyone is of school age, or they have an older sibling or cousin nearby, a children’s table is a good option. When there are only a few children, or they are all toddlers, then it’s best that they sit with their parents. 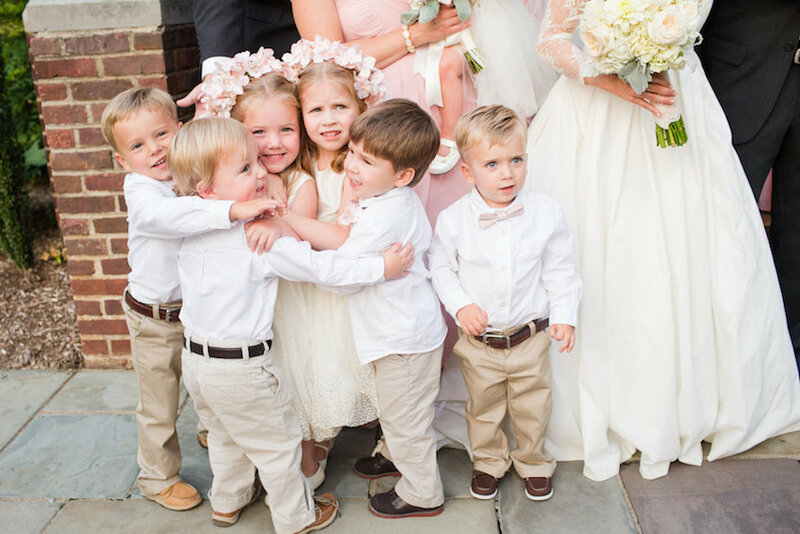 Discover tips to decide if your wedding will be child-friendly or child-free, see 19 ways to keep kids entertained at your celebration, and see how to incorporate children into your wedding ceremony.